Although our moral lives would be unrecognisable without them, roles have received little attention from analytic moral philosophers. Roles are central to our lives and to our engagement with one another, and should be analysed in connection with our core notions of ethics such as virtue, reason, and obligation. What are roles and what is their normative import? To what extent are roles and the ethics of roles central to ethics as opposed to virtue in general, and obligation in general? Are role obligations characteristically incompatible with ordinary morality in professions such as business, law, and medicine? How does practical reason function in relation to roles? 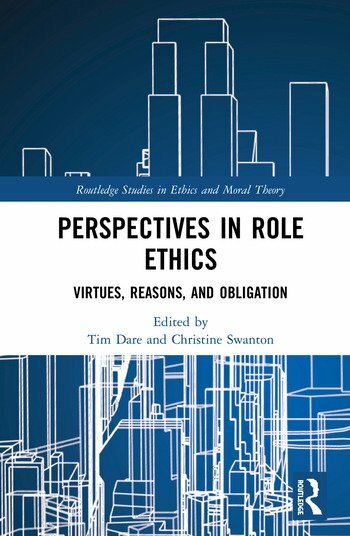 Perspectives in Role Ethics is an examination of a largely neglected topic in ethics. It will appeal to a broad range of scholars in normative ethics, virtue ethics, non-Western ethics, and applied ethics interested in the importance of roles in our moral life. Tim Dare is Associate Professor of Philosophy at the University of Auckland, New Zealand. He is the author of The Counsel of Rogues? A Defence of the Standard Conception of the Lawyer’s Role (2009). He has also written on the philosophy of law and applied and professional ethics. Christine Swanton is an Honorary Research Fellow at the University of Auckland, New Zealand. She is the author of The Virtue Ethics of Hume and Nietzsche (2015), Virtue Ethics: A Pluralist View (2005), and Freedom: A Coherence Theory (1992).